Imperfections are the least flattering features that can be found in each of the body typologies. The task of the Image consultant consists in recognizing and interpreting each client’s typology and their imperfections. As a consultant, once I have analyzed all the set, I can offer you the best suiting solution for each case, as well as your needs and goals. For this type of bust, what best works are rounded necklines, cross-over, deep V and bustier necklines. My recommendation is that you should try to play with the visual effect and balance of the volumes. For example, look for something with Japanese sleeves, which will balance the voluminous effect of your bust, and wear rather thin and long necklaces. What you should avoid (! ): thick fabrics, big lapels, round collars, turtlenecks and short sleeves. Stay clear of scarves, foulards and the sort, because they give an illusion of more volume. Avoid high waists and forget all flashy, contrasting and big prints –even if you love them–, as well as all kinds of glitter, bling, frills and flounces etc. In this case, you are allowed to use everything that the voluminous bust cannot, so unleash your creativity. You may wear all kinds of necklines, except for the bustier neckline (because it makes it seem like you have put a band over you bust!). Play with draped necklines, square necklines, rounded, shawl, draped tops, large collars, frills, folded necklines, pleats and all kinds of prints, as well as scarves, foulards, flounces and statement necklaces. You see, you have it easy. The only thing that you have to avoid is, as I have mentioned before, the bustier neckline in addition to the deep V-neckline, rib knitted fabrics that flattens. Vests may also create this smoothing effect and that does not favor you at all. For small bust, try thin and high waists, since they are a very flattering option. Perhaps you may wonder what to do with a high-risen bust. Well, in this case a V-neck is a good option, in addition to all those who contribute verticality, “small” lapels and long necklaces. And if instead you have a low startup or sagged bust, I recommend rounded necklines with or without volume and a good push up to help reposition the bust. Avoid small rounded collars and V-neck. If you have short arms, I recommend that you always look for a three-quarter sleeves and during winter you can complement them with a pair of long gloves, as this will stylize your short arms. The super long sleeves are also a good option. As much as you may like them, forget bracelets and cuffed garments. I don’t recommend those clothes with tight and short sleeves or sleeveless, because all this will only make the short length of your arms more apparent. Regarding long arms, we must do the total opposite. Everything that helps you create the feeling of a shorter length is what works for you. Details such as cuffs, bracelets, pleats, etc., need to help reverse the arm’s length. 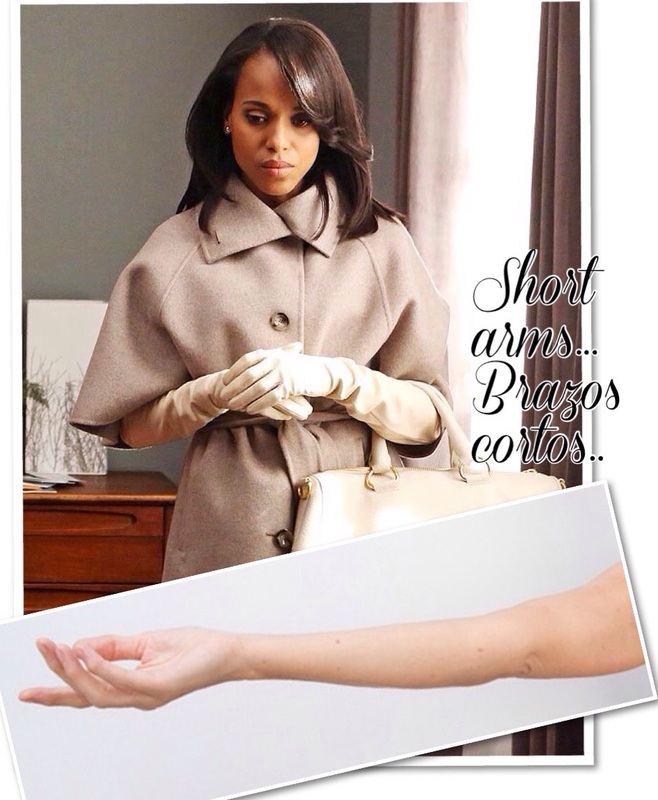 Voluminous sleeves are perfect, such as blouse sleeves, ham, medieval, etc. Do not panic!! in this case we have several strategies we can use. Pants with high, straight, smooth and long waists will be your best allies, but also bear stripes in mind, since they elongate the leg. Never ever wear cuffed pants. The strategy regarding skirts will be to wear them over the knee or just above, if the legs are proportionated. For short legs, I always recommend high waists, unless you have a bulky or fallen bust, in this case we’ll play with the optical effect of balancing the volumes and colors. For upper garments, it’s always better if they’re short and slightly notched. As an advice, avoid baggy pants, or pirates, say no to long flared skirts, always wear low cut shoes and never buckle at the ankle. But as is well known that there is no accounting for taste, and some of you maybe want to shorten your long legs… In this case, low waists are a perfect way to achieve this, as well as horizontally details, ruffles, ribbons, etc. We may not consider long necks as an imperfection, since it is well known that a long neck is synonymous to elegance and poise. So if you’re lucky and you have a long neck, be encouraged to wear any type of neckline or collar, such as wide collars, with Victorian design, turtleneck, with lace, stand collars etc. The square necklines or boat cleavage neckline will enhance your neck more as well as handkerchiefs, scarves, short necklaces and chokers. If instead, you have a short neck, you should be more rigorous in your selection of collars and necklines, plus accessories. I advise necklines which give verticality such as V-necks, mao, tuxedo, runaway and small necks. Regarding jackets, it’s better if they are collarless or have a flap and small tip up. The perfect complements will be extremely long earrings and very thin and long necklaces. Do not wear closed necklines, box or turtlenecks. To finish this block of imperfections, all that remains to go over are the waists. • If your waist silhouette is long, you should know that wearing high empire waists are the most appropriate thing. In addition, you can wear all those details that shorten such as wide belts, coats of mail, short jackets, etc. Do yourself a favor and remove from your wardrobe long garments and pants with volume. • If instead your silhouette is short-waisted, you should know that upper garments will suit you better if they are slightly loose, always in one piece and notched slightly below the waist. The straight one-piece dresses, long or V-neck and vertical stripes in upper garments, are other options for your short waist. If you need a belt in your life, please, preferably wear one that is very fine and place it on the hips. Regarding pants, better if they’re low rise. Inestetismos del cuerpo de la mujer. Los inestetismos son los rasgos menos favorecedores, que podemos encontrar, en cada una de las tipologías corporales. La tarea del asesor de imagen consiste, en reconocer e interpretar cada tipología y los inestetismos de cada cliente. Como asesor, una vez analizado el conjunto, podré ofrecerte, la solución que mejor se adapte a cada caso, necesidades y objetivos. A este tipo de busto, lo que mejor le funciona son los escotes redondeados, los cruzados, de pico profundo y el escote bustier. Mi recomendación es, que tratéis de jugar con el efecto visual y con el equilibrio de los volúmenes. Buscad por ejemplo, manga japonesa, ya que, dará equilibrio al efecto voluminoso de vuestro busto, collares finos y mas bien largos. Que debéis evitar!! tejidos gruesos, grandes solapas, cuellos caja, cisne y manga corta. Prescindir de foulards, bufandas y similares, debido a que dan más volumen aun y se trata de evitarlo. Fuera cinturas altas y olvidaros de los estampados llamativos o contrastados y grandes, por muy locas que os vuelvan, así como, todo tipo de brillos e incrustaciones, volantes etc..
En este caso, podréis usar todo lo que el busto voluminoso no permite, así que da rienda suelta a vuestra creatividad. Todo tipo de escotes, excepto el escote bustier, que parecerá que os habéis puesto una venda, escote drapeado, escote cuadrado, redondeados, cuello chal, tops drapeados, cuellos grandes, volantes, escotes cruzados, lorzas y todo tipo de estampados, además de las bufandas, foulards, chorreras y collares grandes. Como veis, lo tenéis muy fácil. Lo único a evitar además del bustier será, el escote de pico profundo, tejidos como el punto con canale porque aplana y los chalecos, que también crean este efecto de liso y sin volumen, que no os favorece. Para el busto pequeño las cinturas y talles altos, son una opción muy favorecedora. Dos cosas más sobre los bustos. Quizás os preguntaréis que hacer con un busto con inicio alto!! Pues bien, en este caso un escote de pico, si es una opción, además de todos aquellos que aporten verticalidad, solapas “pequeñas” y collares largos. Y si por el contrario tenéis un busto de inicio bajo o caído!! os recomiendo escotes redondeados con y sin volumen, y un buen push up, que ayude a reposicionar el busto. Descartaremos el cuello caja y los de pico. Los brazos y sus inestetismos. Si tienes los brazos cortos, te propongo que busques siempre una manga tres cuartos y en invierno compleméntala con un guante largo, ya que, esto estilizará tu brazo corto. Las mangas súper largas también son una buena opción. Por mucho que te gusten, olvídate de las pulseras y las prendas con puños. Te desaconsejo totalmente, aquellas prendas con mangas ajustadas, cortas o sin mangas, porque todo esto hará más evidente la escasa longitud de tus brazos. En los brazos largos debemos jugar totalmente en sentido contrario, todo aquello que nos ayude a crear sensación, de que acortamos la longitud, es lo que nos funciona. Necesitáis detalles que irrumpan en sentido contrario la longitud del brazo, como los puños, brazaletes, lorzas, etc. Las mangas con volumen son perfectas, como las ablusadas, jamón, medieval, etc. Que no cunda el pánico, en este caso haremos uso de varías estrategias. Los pantalones con cintura alta, rectos, lisos y largos serán vuestros mejores aliados, pero si además llevan raya, conseguiremos ampliar el efectos de longitud de la pierna corta. Nunca pantalón con vuelta abajo. Para las faldas, la estrategia será la de usar el largo a la altura de la rodilla o justo por encima, si las piernas son proporcionadas. Con piernas cortas, yo te recomiendo siempre, la cintura alta excepto si tienes un pecho voluminoso y caído, aquí jugaremos con el efecto óptico sobre equilibrio de los volúmenes y los colores. Para las prendas superiores, siempre mejor cortas y un poco entalladas. A modo de consejo, no a pantalones anchos, ni piratas, no a faldas largas con vuelo y los zapatos siempre escotados y que no se abrochen en el tobillo. Pero como es bien sabido, hay gustos para todo y algunas querréis acortar vuestras larguísimas piernas!! En este caso, la cintura baja es un modo perfecto, los detalles en sentido horizontal, junto con volantes, ribetes, etc. ayudarán en vuestra misión. El cuello y sus inestetismos. Cuando el cuello es largo, podríamos considerar que no estamos ante un inestetismo, ya que es bien sabido que el cuello largo es sinónimo de elegancia y porte. Por lo tanto si eres afortunada y tienes un cuello largo, anímate a llevar cualquier tipo de escote o cuello,como cuellos amplios, con diseño como el victoriano, cuello cisne, con lazada, chimenea, etc. Los escotes cuadrados o barco, serán los que mas realcen tu cuello, así como los pañuelos, foulards, collares cortos y las gargantillas. Por el contrario, si tienes un cuello corto, deberás ser más rigurosa en tu selección de cuellos y escotes, además de los complementos. Os aconsejo escotes que os den verticalidad como los de pico, túnica, esmoquin, desbocado y cuellos pequeños. Las chaquetas, mejor sin cuello o con solapa de punta hacia arriba y pequeña. Los complementos perfectos, serán pendientes largos y collares muy finos y largos..
No a los escotes cerrados, cisne o caja. Para rematar este bloque de inistetismos, solo nos queda por ver, los talles. •Si tu silueta es de talle largo, has de saber que las prendas de entallado alto, tipo imperio son las más apropiadas. Además, de todos aquellos detalles que acorten, como los cinturones anchos, coseletes, chaquetas cortas, etc. Hazte un favor y retira de tu armario las prendas largas y los pantalones con volumen. •Si por el contrario tu silueta es de talle corto, debes de saber, que las prendas superiores te sentaran mejor si son ligeramente holgadas, siempre de una sola pieza y ligeramente entalladas por debajo de la cintura. Los vestidos rectos de una sola pieza, los talles largos o en pico y las rayas verticales en prendas superiores, son otras opciones para tu talle corto. Si necesitas un cinturón en tu vida, preferiblemente que sea finísimo y colócalo sobre la cadera, lo mismo con los pantalones, mejor de talle bajo. → Best fríend’s wedding. – La boda de mi mejor amigo.